John Henry Mole abandoned a legal profession in Newcastle-upon-Tyne in England to pursue a career as a miniature painter in 1835, taking lessons from Thomas Heathfield Carrick. He exhibited regularly in Newcastle and also showed portrait miniatures in London at the Royal Academy. 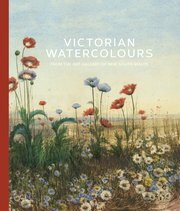 However, he gave up this highly specialised branch of art in around 1847, and devoted himself increasingly to landscapes, undoubtedly a consequence of his successful candidature for membership to the New Society of Painters in Water Colours in 1848. 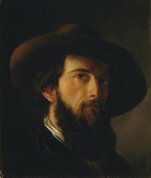 He contributed hundreds of landscapes to the exhibitions of the Society, of which he was elected vice-president in 1884, until the time of his death two years later. He also exhibited intermittently at the Society of British Artists (Suffolk Street), British Institution and Grosvenor Gallery. Mole was not allied to any particular school or movement, and the majority of his exhibited watercolours drew their inspiration from Northumberland, the Lake District and Scotland. His touch could vary from the meticulous and detailed to the loose and vigorous, allowing him to capture breezy effects of light and atmosphere. However, his compulsion to add figures into his compositions did not always produce satisfactory results. Mole’s The road to the peat bog, near Barmouth, North Wales 1874 was among the first works purchased for the fledgling Art Gallery of NSW collection.